EDocGen online Mail merge is one of the most sought-after features. It addresses many limitations of Microsoft mail merge including vertically aligned data merge, paragrph and image population. But it's the ability to merge multiple excels rows into a single Word document stand out. Mail merge performs a one to one merge by default and produces one document for every row of excel. Let’s say you are creating a sales performance report. If you have 5 sales reps and each rep closed 5 deals, when you do a mail merge, you create 25-word documents instead of one for each sales rep. Recently one of the user asked me whether he can use EDocGen for many to one mail merge. Sure, EDocGen supports dynamic population of Excel data into Microsoft Word / PDF templates. All it requires is support for grouping of excel data. 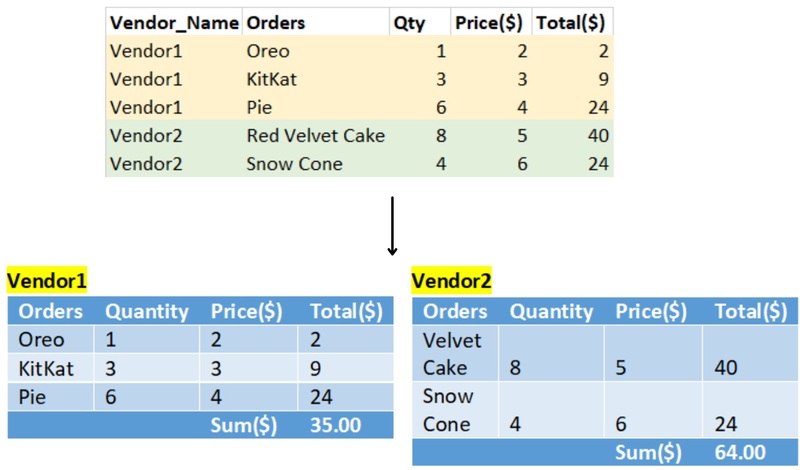 So, I went about playing with the Excel data so that I can populate it into dynamic tables and text fields for invoice genetation. All in all, it took me less than 30 minutes to create the solution, with most of the time going towards setting up the Excel. Before explaining how to go about online directory merge with EDocGen, let’s explore a couple of use cases. You can see lots of use cases for this problem in your business. There is no fun in manually creating documents when mail merge doesn’t support your requirements. John is a service manager and his team members visit customer businesses 4 times a month for reviewing and providing services. At the end of the month, he sends letters to his customers, informing of all the visits his service reps for that month and thanking the customer. Regular mail would generate 4 documents for each customer. Certainly, it’s no-go for John and is currently manually updating word docs. Jane is a VP of a medium size organization. She regularly submits compliance documents state prescribed formats. Any deviations in the formats are not accepted in the submission. Her team gathers the data from data warehouse and manipulates it using BI solution. However, due to the formatting requirements, her BI reporting tool cannot be used. So she is left with mail merge. But instead of creating a proper document, it gives a page for every row thus leaving her creating hundreds of word documents manually. Fortunately, there are quite a few good solutions out there. If you Google the keywords “Mail Merge Multiple Rows into One Document“ or “Mail Merge with Grouping,” you find many to one mail merge add-ins from Graham Mayor and Doug Robbins. Both are excellent with a small learning curve. But remember, these are add-ins. Some organizations have strict policies around add-ins for security reasons. If above options are not for you, EDocGen online mail merge is your default choice. Apart from supporting many to one mail merge, it supports both vertical and horizontal orientations of excel data and retains your exact formatting of numbers and dates in excel. Not just that. EDocGen allows you to do more with generated documents. You can email, print or save them in Google drive. Step1: Following is the excel file for many to one mail merge. This sample file has 3 customers, each one receiving different products. Step2: Next step is to massage the Excel data to bring it in a format acceptable to EDocGen. This is a one-time job. In the future, we plan to automate this in EDocGen. No doubt, this is a little tedious. If you find it hard to do, send us the sample Excel file and we create this format for you. Notice that I modified the Excel sheet inline with the document template. Unlike regular mail merge, EDocGen allows you to have the desired name for an excel column. In the mapping screen, map the dynamic field to the excel column. You find more details about it in the next step. EDocGen also allows you to include calculations in document templates. However, here I'm performing calculations in Excel. Step3: Populate word template with the formatted excel. Please refer to Excel to Word or Excel to PDFto know to more about excel data population. Upload excel and click generate to create 3 documents corresponding to 3 customers - each containing the respective products they receive and the invoice amounts. As you can see, EDocGen is the simplest and fastest solution for online many to one mail merge. Register and start performing your many to one mail merge.